Julie got a job with UFV Study Abroad, and requested a blog post from me about my time over there and if I had any advice for anyone who is looking at adventuring out. My decision to study abroad was fuelled by many different factors - a desire to see a place other than my own home, to expand not only my knowledge of the world but also of people, and an intrinsic need to just live differently. 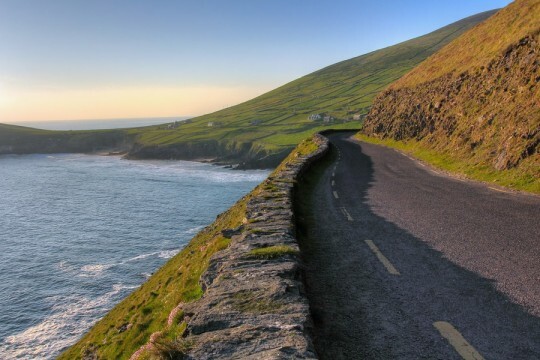 Ireland specifically has been somewhere I've always wanted to go, and I eventually felt like all those study abroad posters in the UFV halls were just for me, telling me to go, urging me to actually make it happen, rather then just imagine it. And for how scary it was, making plans to live somewhere I couldn't even accurately picture, I am so unbelievably happy that I went ahead with it and did it all anyway. There are so many parts to what made my experience so incredible, and it would take forever to describe it all, so I've done my best to condense it! I lucked out, and got to travel with another student from UFV, Julie, who after a very long plane ride, and a few short weeks, became one of the best parts of my whole experience. We also got to meet about 25 other international students from all over (mainly) Europe and Brazil, and they became my family away from home. They are some of the best people I've ever known - people with the biggest hearts, an uncanny love for adventure, and somehow even when I was right along with them, they inspired me to do whatever it took to really live life. And while we were abroad, live life we did! Sure, there was school involved, and that did stay a priority, but we also traveled, went to pubs once a week (ok, maybe a bit more then that), and got to be a part of something that was unique to just us - a whole bunch of students from all over the world, living in a country foreign to all of us, trying to soak up and really experience every single day. We took the opportunity during a couple of our weeks off from school to travel around the west coast of Ireland, and then to travel to four other European countries. Every single place held a different taste of life, and it's amazing to see how other people live - to realize that "normal" isn't actually a thing, because it all depends on where and how you choose to live. When I look back at my five months in the land of luck, I remember more then just the traveling though. There's too many amazing moments to pick a favourite, but one of the contenders happened in the first week. All us international students had been introduced a couple days ago, and we were still at the point where we were learning each other's names, overcoming jet lag, and with wide-eyes, adjusting to the fact that we were in Ireland. There were 20 of us that went out to a pub one night, and we got put into the smoking room because there wasn't enough room in the actual pub. I distinctly remember being in that room, smelling nothing but smoke, being absolutely freezing cold, and sitting squished between an American girl and a Polish guy. And I was so happy - because there I was, amongst all these other people who have not only the capacity to dream greatly but to act on it; because I was sitting in Ireland, with it's green hills and sheep and beer; and because I felt alive, sparked by everyone and everything. And so to anyone reading this, who even has an inkling of going - do it. It will at times be hard, and it will be scary, but I guarantee it'll be even harder to leave when it's all over. The experience, the adventure, and the places and people you will meet will be worth every single problem you may encounter. It is worth it ten-fold. So go research, go dream, and go make it happen.